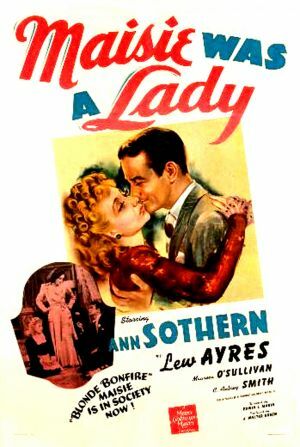 At the height of Sothern’s association with this role, she was also starring from 1945 to 1947 in The Adventures of Maisie on CBS Radio (and later with the down-market Mutual in 1952, and further in syndication, which I understand for so short a radio series indicates some exceptional quality that delivers an audience). The role seems to have determined the course of her entire career; after Maisie, she starred in two sitcoms for CBS, Private Secretary and The Ann Sothern Show, and garnered three Emmy nominations. Then she appeared as the voice of Gladys Crabtree in My Mother the Car, Gladys being the deceased mother whose spirit has somehow transmogrified into a 1928 Porter touring car. This sitcom is generally considered to be either the worst or the second worst TV program of all time (first being Jerry Springer). Finally, Sothern was nominated for an Academy Award for best Supporting Actress for The Whales of August (1987), standing out among an exceptional cast, including Bette Davis and Lillian Gish. Maisie’s (movie-based) character is that she’s a wisecracking burlesque showgirl from Brooklyn with a spirit as big as all outdoors, and a heart of solid gold. Perhaps the other way around. At any rate, Maisie mostly starts out having just lost her job and down on her luck. She meets a guy who annoys her, but for whom she appears to feel some kind of romantic attraction. Simultaneously, she enters a new environment in which she is a breath of fresh air in some respect — kind of like the plot of most Shirley Temple movies. Maisie’s plainspoken ways break down emotional reserves and misunderstandings that have been hampering progress, everything ends happily and Maisie gets the man, although he conveniently disappears before the next movie. Apparently during WWII this was more common than it is these days; well, no, I’m kidding. It’s just that, at the beginning of every Maisie movie, all previous plot developments get retconned out of existence and new ones freely take their place. So Maisie doesn’t really have a history; it’s more like an attitude. 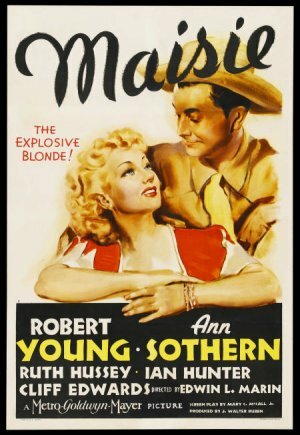 I certainly understand why Maisie was career-making for Ann Sothern; it was a role that appears to have struck a chord with the public and heaven knows she made it hers. I think the fact that it started in 1939 had something to do with it, but it’s hard to say just what. We know that 1939 was an amazing year for films, perhaps the best year ever, and I think that was a year that formed people in the habit of going to the movies two or three times a week, because they were just so damn good. 1939’s list of movies includes Wuthering Heights, Stagecoach, The Women, Gone With the Wind, The Wizard of Oz, and quite a few important mystery films, including Another Thin Man, The Adventures of Sherlock Holmes, Charlie Chan at Treasure Island (yes, I’m serious), and Nancy Drew and the Hidden Staircase (yes, I’m serious). It was also the first rumblings of WWII in the United States, and I’ll suggest that Maisie’s plucky spirit and get-down-to-work attitude were felt to be a help to the war effort, if you know what I mean. Maisie does a lot of war work during WWII, alternating between riveting and entertaining the troops, etc. So I imagine she was a kind of symbol for women; Maisie had her priorities ostentatiously in order and didn’t mind going nose to nose with people who weren’t pulling their weight. After the war, as the series petered out, Maisie was more often the agent of Cupid, working to get two good-hearted young people back together after a romantic misunderstanding. It rather seemed like it had outlived its usefulness until it transferred to radio, where they essentially told the same set of stories again. Warning: If you read beyond this point, you may find out more about the plot of the first movie in the series, Maisie (1939) than you want to know, and a bit about some others. If you haven’t seen these films, you may wish to stop here and preserve your ignorance in favour of future enjoyment. Consider yourself warned. I originally became interested in the series because I happened to capture #1 on my PVR, from Turner Classic Movies, and found that it had some minor detective content. Maisie is stranded jobless in a small town in Wyoming and finagles her way into a position as live-in maid on a ranch, against the wishes of her soon-to-be romantic interest, cowboy boss Robert Young. She is the servant to the ranch owner’s wife (Ruth Hussey, who does a wonderful job), a slick city orchid who is superficially attentive to her wealthy husband but is really committed to her lover, city slicker John Hubbard. Maisie finds the boss’s wife locked in the arms of her boyfriend by accident; the boss’s wife decides that Maisie must go, and she cooks up a story about how Maisie is romantically involved with the boss, which simultaneously torpedoes Maisie’s job and her engagement to Robert Young. So she leaves. The boss then commits suicide but in such a way that it looks like homicide, and Robert Young is put on trial. Maisie is far away and only finds out about the trial in time to arrive barely before sentencing, but she can’t persuade the judge that Robert Young is innocent — until the boss’s lawyer comes up with an envelope that he had been told to deliver to Maisie. It’s a complete explanation, Robert Young goes free, and Maisie inherits the ranch and lots of money, to the well-deserved chagrin of the widow. We are meant to believe that Maisie is about to marry Robert Young, but as I said, he disappears before the next movie and all the money is gone. This is really the only detective/mystery content I could identify in the whole series, worse the luck. I watched them, at least as far as #8, with an eye to a potential piece not unlike this about their detective content. Since that’s pretty much it for interesting content, I was going to put it aside. But I have to say this. I’m not sure I could have stood the final entries in this series; the whole thing is just too darn depressing. Okay, not depressing at the level of UK kitchen sink drama or Russian expressionism or Italian postwar cinema. But depressing. Chillingly depressing. 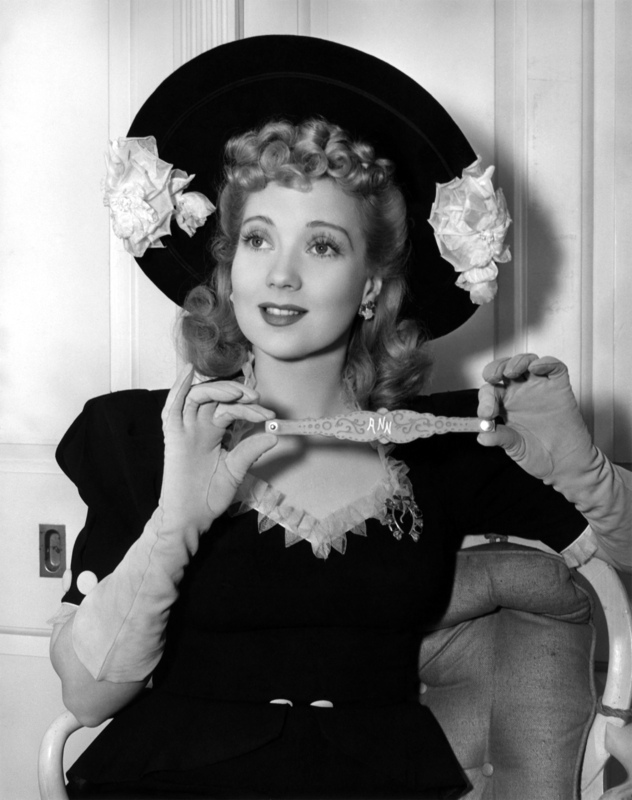 Ann Sothern is plucky, but man oh man, is that the knife edge upon which people like her used to balance? Not really knowing where their next meal was coming from if they didn’t finagle their way into a job? Because that’s what happens in the Maisie series, over and over. Maisie loses her job and is about to — well, I have no idea, unless it’s starvation added to prostitution or a similar life of crime. She never gets to it, thank goodness. But she is pretty much about to be what we would think of as a homeless person, and she finds herself among a group of people who are similarly down and out. There is one entry, 1940’s Gold Rush Maisie, in which she is taken in by what I believe is called a family of Okies; these people have nothing but an old car and enough food to make it through a day or so. No money, no education, no social services, and possibly not even a change of clothes. I admit it is not too hard to believe that Maisie is imminently going to rally people to work together to improve their collective lot, but still, I mean, good heavens! This is not a light comedy about a Brooklyn showgirl, this is more like The Grapes of fricken’ Wrath. Now, I don’t mind that kind of entertainment, when I sign up to see it. What I do object to is being told that I am about to see light entertainment with occasionally a song and dance, and being taken to the depths of despair. And once that became plain, each entry began to demonstrate an affinity for melodrama and pathos, followed closely by bathos. In Ringside Maisie, for instance, her boxer friend is knocked out and comes to blind; only his life’s savings will finance the brain operation he needs, and that will put paid to his ambitions to follow in his father’s footsteps and open a small country store. In the next one, Maisie Gets Her Man, everyone we meet is completely broke and desperate; everyone rallies together to follow a cherubic guy who turns out to be a con artist who cheats everyone out of the pittances they have, then leaves town. Maisie Was a Lady has her as a maid to the daughter of a wealthy but emotionally cold family who is so screwed up that she does her darndest to commit suicide. I think the last few entries in the series are a bit more lighthearted, but honestly, I just don’t want to take the chance. The way I see it, all these films are about a character, and that character never changes throughout the course of the films. In fact, the audience would be disappointed if Maisie did change in any way. Therefore, the natural story elements are preserved by having other characters change in an appropriate way around her, and usually on a simple and predictable path — poor to rich, bad to good, wrong to right. I have no data on the audience for whom these were designed, but I speculate that it was uneducated and primarily female; women with no money and no power who enjoyed Maisie wading into emotionally overwrought situations and sorting out people who were on the wrong track. Maisie was always just a little brassy and a little overdressed and a little florid, and I think this appealed more than lame evening gowns and brittle social comedy would have done. So whether you will enjoy this series or not depends on your capacity to tolerate soap opera, pseudo-social commentary, overwrought romanticism, and/or Ann Sothern. Mine revealed itself to be limited to eight-tenths of the oeuvre; your mileage may vary. This entry was posted in Brand, Film, Multi-platform, Mystery, Radio and tagged Ann Sothern, Charlie Chan, Douglas Sirk, Jerry Springer, John Hubbard, Maisie, My Mother The Car, Nancy Drew, Private Secretary, Robert Young, Ruth Hussey, Sherlock Holmes, Shirley Temple, The Adventures of Maisie, The Ann Sothern Show, Thin Man, WWII. I disagree with your assessment of those who would enjoy the Maisie series are uneducated women. With no money and no power. I very much enjoy the series. I am not uneducated unless you dismiss a MS degree holder as uneducated. While not not a member of the super rich, I have a comfortable income. Similarly, while not I would not describe myself as a super power, I have all the power I need over my own life circumstances and choices. You are, however, correct that I am female.